Sou fascinada pôr plantas , amo amo principalmente suculentas e cactos de todas espécies quando estou com elas esqueço de tudo a minha felicidade é muita, um forte abraço ! ??? Hi Kathleen — You want Pacific Northwest driftwood. Katie (who is from Washington) gathered these on a visit, but I did find a supplier online: Drifting Home. What do you suggest using for preserving or finishing the driftwood so that it is safe for the plants? Do you have a certain brand of product you like to use? 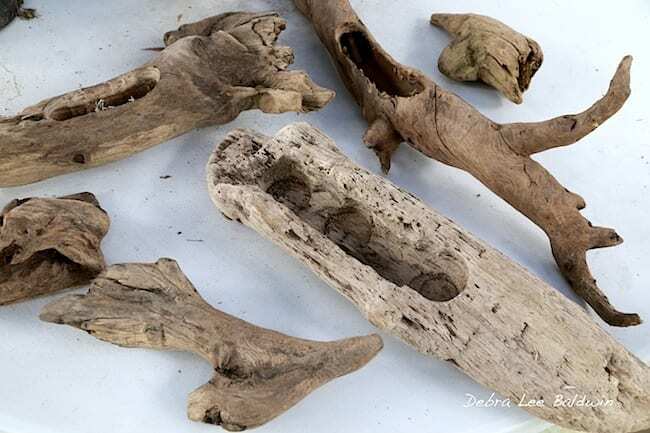 I blast it with a hose to dislodge loose dirt and accretions, scrub it with soapy water if it’s really dirty, soak it for several days in a tub of water to which a little bleach has been added (1/4 cup bleach to 5 gallons of water), then place the wet driftwood in the sun to dry for several days. How do you care for the succulents once it’s been made?